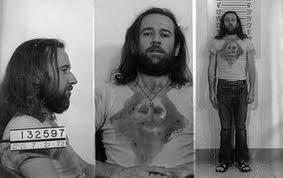 On July 21, 1972, comedian George Carlin was arrested at Milwaukee, Wisconsin’s Summerfest and charged with violating that state’s obscenity laws after performing his controversial routine, “Seven Words You Can Never Say on Television,” originally contained in his album Class Clown, recorded May 27, 1972 at the Santa Monica Civic Auditorium in California. Carlin climbed to fame in the 1960s in part due to his successful appearances on The Ed Sullivan Show, where his observational humor on American culture and society built a solid following. He began as a traditional, clean-cut, suit-wearing comedian, but as the 60s progressed and the hippie culture began to rise, Carlin changed both his routines and his appearance. He began sporting long hair, a beard, faded jeans and earrings – a change in persona that resulted in the increasing loss of TV bookings. Carlin took to the road to hone his routines, sharpening their edges and eventually garnering a newer, younger audience, particular on growingly liberal college campuses. His routines became more edgy, provocative – and politically charged. Carlin’s 1972 obscenity case became a cause célèbre for free speech; he began referring to the taboo words as “the Milwaukee Seven.” In December of 1972 the court case was eventually decided – and dismissed. The judge ruled that, while Carlin’s language was definitely indecent, Carlin had the freedom to say it, as long as he caused no disturbance. The ruling opened the floodgates for comedians of all ilk to expand their routines into once forbidden territory. In October of the following year, Carlin released his fourth comedy album, Operation: Foole. Contained on the record was a track similar to the now famous “Seven Words” routine, called “Filthy Words.” On October 30, the track was aired uncensored on New York City radio station WBAI, a Pacifica Foundation FM station. A father listening to the broadcast with his son complained to the Federal Communications Commission about the broadcasting of such questionable material material unsuited for the sensitive ears of children. Following the lodging of the complaint, the FCC requested a formal response from Pacifica, but, failing to hear any compelling reasons, issued a declaratory order upholding the complaint. No specific sanctions were included in the order – although many sought to fine the company for violating FCC regulations that prohibited broadcasting “obscene” material — but WBAI was put on notice that “in the event subsequent complaints are received, the Commission will then decide whether it should utilize any of the available sanctions it has been granted by Congress” — including pulling the station’s license and yanking it off the air. Pacifica, believing the order to be an assault on the freedom of speech, appealed this decision, which ultimately made its way to the Supreme Court of the United States in 1978. In Federal Communications Commission v. Pacifica Foundation, the court upheld the FCC action by a vote of 5 to 4, ruling that the routine was “indecent but not obscene” and that the FCC had authority to prohibit such broadcasts during hours when children were likely to be among the audience. The justices affirmed the government’s power to regulate indecent material on the public airwaves. Carlin would find an uncensored outlet for his material with the advent of cable TV, which, as private subscription, was not beholden to the same content restrictions as public-airwaves broadcast stations. In 1977, he filmed the first of fourteen stand-up comedy specials for HBO, which had begun transmission in 1972. His final HBO special, It’s Bad for Ya, was filmed less than four months before his death in 2008.